Advisor uses 6 trading strategies you can customize each strategy separately. Powered by 7 pairs and 1 timeframe M1 and uses a variety of trading systems. This increases the chances of stable growth and reduces the influence of one pair. The robot uses intelligent averaging system. Advisor is able to self-adjust their work. Instead of searching for values ​​satisfying historical prices for each pair, the adviser uses the values ​​effective on all cylinders, which increases the likelihood of good results on the future price movements. Advisor adapts to any market behavior (trend or the flat). It does not need complex trading conditions or high execution speed, works with any broker and does not consume excessive computer resources. The adviser works on the following pairs: EURUSD, AUDUSD, NZDUSD, USDCAD, CADCHF, AUDCHF, USDCHF, and timeframes: M1. The minimum recommended balance for the adviser (when used at recommended pairs) - $ 3000 or $ 30 cents. Order Type — Selection of the direction of trade. Order Comment — Comments to the order. Slippage — Permissible slippage before order triggering. Information_graphics — Information on the chart. Lot Multiplier — Multiplication lot. Step Order 2 — Order Step 2. Step Order 3 — Order Step 3. Step Order 4 — Order Step 4. Step Order 5 — Order Step 5. Step Order 6 — Order Step 6. Step Order 7 — Order Step 7. Step Order 8 — Order Step 8. Step Order 9 — Order Step 9. Step Order 10 — Order Step 10.
bars for Next Order — The distances between the orders in bars. Virtual Trailing Stop — Points trailing when profit position. Virtual Trailing Step — Step trailing when profit position. Virtual Trailing Stop BS Zero — Points trailing when profit position. Virtual Trailing Step BS Zero — Step trailing when profit position. Monday — If true, trade on Monday. Tuesday — If true, trade on Monday. Wednesday — If true, trade on Wednesday. Thursday — If true, trade on Thursday. Friday — If true, the trade on Friday. Use time — If true, there is a trade in time. Time_Setting — Server Time or the time of the computer. GMT_mode — offset determination server time broker mode with respect to GMT. (0 - unused). Every_Day_Start — start time (hh: mm). Every_Day_End — end time (hh: mm). Use time — If true, the trade is on time. Disable_in_Friday — finishing time on Friday (hh: mm). Очень хорошо что можно взять в аренду на пол года что бы потестить систему! Установил на одну валютную пару и отбил полугодовую аренду за неделю! Очень нравится советник, рекомендую к покупке, даёт вполне достойные результаты в торговле, окупит себя очень быстро и принесёт прибыль. Работаю им пока что две недели и результаты в реальной торговле радуют! 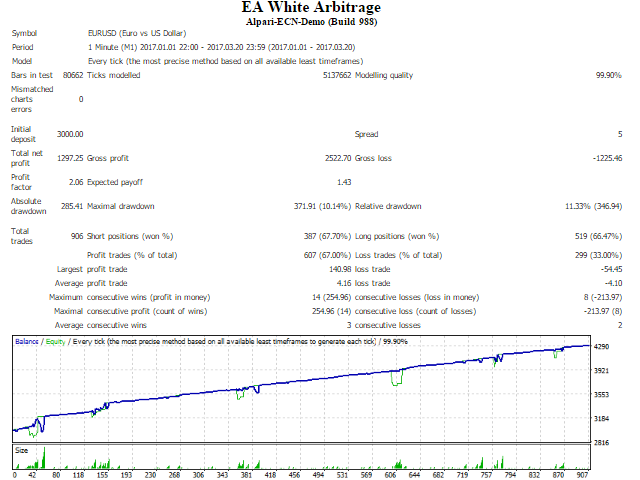 Good EA with closing positions fast because of it Virtual Trailing and also like the way it trades. Keep up the good work Ruslan and I like this EA.